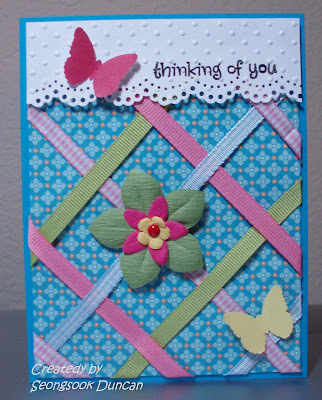 This card is for one of Saturday Challenges at Card Maker's Spring Crop. You may use any color ribbon but it must be 1/4 inch. You must have a header, one sentiment & one embellishment. Stay true to the format of the ribbon they must crisscross. TIP: Start with the center ribbon from point to point then 1 inch apart. It was fun to play with ribbon. This screams spring with those wonderful colors! Love the whole layout! Great card my friend!